When Should You Call the Emergency Dentist in Washington, DC? You take a cool drink of water, accidentally bite into a piece of ice, and immediately feel a shooting pain radiate throughout your entire jaw. You give it a moment to stop, but you can practically hear your tooth throbbing. You’re disoriented by the pain, and you don’t know what to do. Should you call 911? Do they even take care of this sort of thing? What is the fastest way for you to get relief? Firstly, don’t go to the emergency room; this is the exact kind of situation where you should call your emergency dentist in Washington, DC, Dr. Yelena Obholz. It’s the only way for you to get the treatment you need quickly. Each year, over a million people go to the emergency room because of dental problems. While they might be able to provide medication to stop the pain, very few emergency departments are equipped to actually handle dental care. More than likely, they will make you wait behind more urgent patients, or divert you to a dental practice anyway. When it comes to emergency dental care, the best place for you to be is with your dentist in Washington, DC. They’ll have both the tools and the training to give you the exact kind of help that you need. 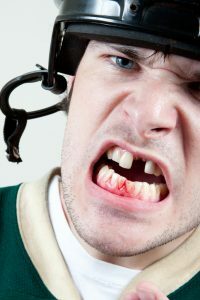 Keep a knocked out or broken tooth wet. Put it back in your mouth or in a container of milk. This will preserve it until Dr. Obholz can see you. Rinse the injured area with warm water to prevent infection. Use a cold compress to reduce the pain and swelling. Ideally, have someone else drive you to the office. The care you receive immediately after a dental emergency is just as important as what you will get at the office. The initial moments are critical. When you make it to the office, your dentist in Friendship Heights will quickly get to work relieving your pain and fixing your problem. A serious injury to your teeth can be a very distressing experience, and trying to think clearly at that time can be difficult. Fortunately, you can now have a plan in place. Hopefully you never have to use it, but it can still give you peace of mind, and make all the difference if you ever do. If you’d like to know more about what to do in a dental emergency, or how to prevent one, please give us a call today.